An evolution of the original Radiomir, the Panerai Radiomir 1940’s sturdy lugs are formed from the same piece of steel as the case. 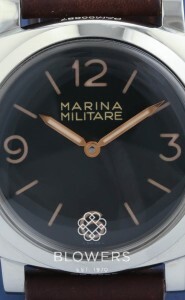 With the simple, highly legible dial typical of Panerai watches, the Radiomir 1940 features a cylindrical crown and omits the distinctive bridge common to other Panerai models. 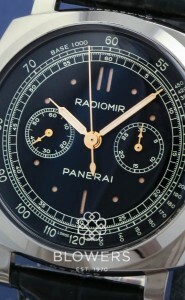 Whilst Radiomir, the radioactive luminescent material is no longer used, the name continues to grace the dial of some incredible timepieces. The luminescence of the modern-day Radiomir remains sublime, delivering magnificent legibility, whatever the hour. 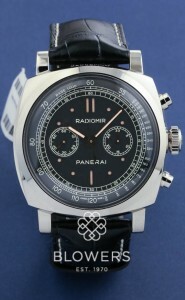 Blowers stock a range of Radiomir 1940 watches in used and unused condition. 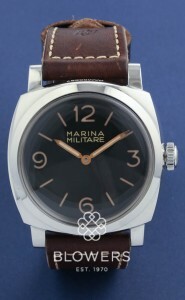 All our pre-owned watches come with a one-year guarantee. Browse our current stock below. All watches on our website are physically in stock at our Kingston upon Hull boutique, and can also be viewed by appointment at our office in London’s Mayfair.